please contact Shabda Press for special discounts. "Lowell Jaeger is a rare talent: a writer both accessible and revelatory, humane and incisive. I found this to be a beautiful read, a story about all the different manifestations of love — a story that stays with you. Someday I’d Write This Down charts the ordinary and extraordinary moments of the poet’s life, from a childhood fishing trip to the Cuban Missile Crisis to the death of an aged parent. Jaeger is at his best here — full of emotion and vigor, packed with drama and substance. This author is a joy to read, and I learn how to be more human every time I pick up one of his books." "A lover of words, Lowell Jaeger, is haunted, focused, spiritual, and generous. I am captured by the emotion of each poem, how one life can speak to the times we all have experienced. In Someday I’d Write This Down, Jaeger’s place in this world is seen through three stages of himself — boy, young man, old man. Ordinary happenings are filled with extraordinarily rich detail, opening into a flower of color just below the invisible. His emotional songs can make you cry but are also healing. Jaeger has made a life of working with words, and here he has arranged his poems into another medium of expression — a dramatic play — where we may enjoy the power of his poetry on stage." Nominated for a Rhysling Award and five Pushcart Prizes, Jennifer Clark’s poems, essays, and short stories have been published in numerous literary journals and anthologies. The Midwest Quarterly, Women’s Studies Quarterly, Windhover, Concho River Review, Ecotone, Nimrod, and Flyway are some of the journals that have made a home for her writings. Her short story published in Fiction Fix received their Editor’s Choice Award and her play, “Father’s Not There,” was featured at the U.S. National Conference on Child Abuse and Neglect. She lives in Kalamazoo, Michigan. "The story is part of our American landscape: Johnny Appleseed going from field to field, town to town, planting his seeds, redeeming the misnomered forbidden fruit. Historians have recorded the life of Johnny A, real name John Chapman. But Jennifer Clark has searched the archives of the soul of this enigmatic sower of the fruit that brings tart sweetness to the mutability of autumn. In lyric poems created with that most extraordinarily difficult of approaches, the plainsong, Clark resurrects the man, his world, his benevolent eccentricity. She gives us something much more mysterious than the legend: she gives us the real. As we accompany the John Chapman we consider what it means to give without ever knowing the result. And we thank Jennifer Clark for doing the same." "From a couple of poems, I watched this book grow into the amazingly informed text it is now. 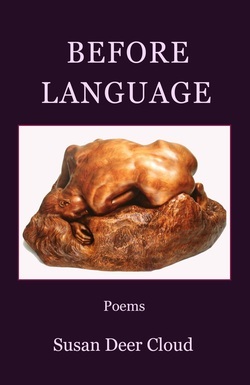 Clark’s research is thorough, and the poems are beautiful and evocative. It’s like two books in one: a book of poetry that encompasses America’s past through the vehicle of Johnny Appleseed. As he moves through the country sowing his seeds, the American landscape, too, evolves, warts and all. The lives of pioneers and settlers, the displacement of Native Americans, slavery, the Pony Express right up to the internet. It’s such an accomplishment. And the end notes are as entertaining as the poetry. lf history had been taught like this, I would have come to it much earlier." Lowell Jaeger (Montana Poet Laureate 2017-2019) is founding editor of Many Voices Press and edited New Poets of the American West, an anthology of poets from eleven western states. Jaeger is a graduate of the Iowa Writer’s Workshop, winner of the Grolier Poetry Peace Prize, and recipient of fel- lowships from the National Endowment for the Arts and the Montana Arts Council. Lowell was awarded the Montana Governor’s Humanities Award for his work in promoting civil civic discourse. He is the author of seven other collections of poems, the most recent of which is Or Maybe I Drift Off Alone (Shabda Press 2016). ​Lowell Jaeger teaches creative writing at Flathead Valley Community College in Kalispell, Montana. He is author of six collections of poems: War On War (Utah State University Press, 1988), Hope Against Hope (Utah State University Press 1990), Suddenly Out of a Long Sleep (Arctos Press, 2009), WE (Main Street Rag Publishing, 2010), How Quickly What's Passing Goes Past (Grayson Books, 2013) and Driving the Back Road Home (Shabda Press, 2015). He is founding editor of Many Voices Press and recently edited New Poets of the American West, an anthology of poets from western states. He is a graduate of the Iowa Writer’s Workshop, winner of the Grolier Poetry Peace Prize, and recipient of fellowships from the National Endowment for the Arts and the Montana Arts Council. In 2010, Jaeger was awarded the Montana Governor’s Humanities Award for his work in promoting civil civic discourse. ​"Deborah P Kolodji’s haiku collection is a gem. Born of an art that transcends science, her haiku transport the reader into the past and future, while being firmly rooted in the present. Highway of Sleeping Towns underlines the truth that the the best haiku are contemporary and ageless, personal and universal. Mariko Kitakubo has published five books of tanka including two bilingual ones, On This Same Star and Cicada Forest. She has also produced a CD of her tanka titled "Messages." Takuboku retained the traditional thirty-one syllables of the tanka but divided them into three lines, instead of the traditional single line, giving the form greater dramatic possibilities. “Mariko KItakubo's sixth book of tanka is a masterpiece of disquiet and profound yearning. It's poetry speaks to the human condition in an era that has just begun to understand, and attempt to divert and remedy, a ruination that evidence shows mankind itself has inflicted on the planet. Indigo leaves us gazing with longing upon our own disappearance into the existential drifts of time and materiality. Kitakubo writes, "my motherland / will be a coffin / of the stormy wind" and points to "the light rain / of radiation" to show us how "history is settling / in the bottom of the river." She sees herself as "an infinitesimal / splash in the dust" and outlines in images of stark finality a vision of sunflower seeds and a people-less planet "after the dream / of civilization." Here is poetry that steps with courage and passion into the forum of ideas and the enormous issues of our day. Kitakubo's mastery of the ancient tanka form gives to her testament in Indigo the perspectives of personalized history and the high art of a compelling literary tradition. --Michael McClintock, President, Tanka Society of America (2005-2011) and author of "The Tanka Café" in Ribbons: Tanka Society of America Journal. "From floating lanterns at Hiroshima to the unstoppable petal storm of cherry blossoms, Mariko Kitakubo’s vivid imagery tugs at the full range of our emotions—from the horror of war to the joy of a new love, from redwood forests to dreams of Betelgeuse, Indigo is a highly recommended journey you will never forget." David Giver is the author of A Slow Education (Shabda Press, 2013) and How to Commit Suicide (Unthinkable Creatures, 2013). He is on the staff of the Southern Poetry Review, and he teaches at Armstrong State University. Author of Hyacinth for the Soul (Deerbrook Editions, 2009), A Passing (Deerbrook Editions, 2014), Light at Point Reyes (Shabda Press, 2012) as well as co-author of Peach Girl: Poems for a Chinese Daughter (Grayson Books 2002), Joan I. Siegel is recipient of Poetry Quarterly's Rebecca Lard Award, New Letters Poetry Award and the Anna Davidson Rosenberg Prize. A finalist for the Pablo Neruda Prize, she has published widely in journals and anthologies. Siegel lives in the lower Hudson Valley of New York State. Emerita Professor of English at SUNY/Orange, she volunteers at a local no-kill animal shelter, tends to 10 rescued cats, plants a summer garden and watches it grow. Lowell Jaeger teaches creative writing at Flathead Valley Community College in Kalispell, Montana. He is author of six collections of poems: War On War (Utah State University Press, 1988), Hope Against Hope (Utah State University Press 1990), Suddenly Out of a Long Sleep (Arctos Press, 2009), WE (Main Street Rag Publishing, 2010), How Quickly What's Passing Goes Past (Grayson Books, 2013) and Driving the Back Road Home (Shabda Press, 2015). He is founding editor of Many Voices Press and recently edited New Poets of the American West, an anthology of poets from western states. He is a graduate of the Iowa Writer’s Workshop, winner of the Grolier Poetry Peace Prize, and recipient of fellowships from the National Endowment for the Arts and the Montana Arts Council. Most recently, Lowell was awarded the Montana Governor’s Humanities Award for his work in promoting civil civic discourse. Nahshon Cook’s poems have appeared in literary publications including Spiritual Directors International, The Houston Literary Review, Post Poetry Magazine, Epic Rites Journal, the Origami Poetry Project, Euonia Review, and the Salmon Poetry Anthology Dog’s Singing. His first collection of poetry A New Beginning was published in January 2010 by Paper Flower Press and was nominated for the 2011 Colorado Book Award. He has poems forthcoming in Presipolis Magazine, A&U, and the Desperanto Press Anthology: Bound By Secrets 2. "Nahshon Cook’s The Killing Fields is a magnificent map of poems. These powerful and quiet poems lead us on a poetic journey through Cambodia, China, Nepal, Thailand, and America. They also beckon us toward an interior human journey. We meet lepers and angels, dancers and lovers, monks and mothers. These intricately crafted poems are both the road and the signposts. They map a way of compassion that observes and hopes. On the nights you can’t pray, just take out this book. These poems will point you in the right direction." "Nahshon Cook's poetry is heart wrenching but beautiful. To read his words is to be lifted from your luxuries and comforts by the talons of a hawk and dropped into a valley full of mirrors where you must face your own humanity and absence of it each time you turn around." Nominated for a Rhysling Award and two Pushcart Prizes, Jennifer Clark ’s poems and short stories have been published in numerous literary journals and anthologies. Failbetter, Poemeleon, The Midwest Quarterly, Windhover, Main Street Rag, Storm Cellar Quarterly, Solo Novo,Structo, Paper Crow, Spittoon, and pacificREVIEW are some of the journals that have made a home for her writings. Her work has been anthologized in such places as Dogs Singing (Salmon Press), Complex Allegiances (Wising Up Press), Zombies for A Cure (Electrik Milk Bath Press), Pain and Memory (Editions Bibliotekos), Growing Concerns: An Eco-Horror Anthology (Chupa Cabra House), and [Ex]tinction & [Ex]tinguished Anthology (Twelve Winters Press). Her play “Father’s Not There” was featured at the U.S. National Conference on Child Abuse and Neglect. Her short story published in Fiction Fix received their Editor’s Choice Award. She lives in Kalamazoo , Michigan where she is director of community relations for Communities In Schools of Kalamazoo. Author of HYACINTH FOR THE SOUL and co-author of PEACH GIRL: POEMS FOR A CHINESE DAUGHTER, Joan I. Siegel received the New Letters Poetry Prize and Anna Davidson Rosenberg Award. A finalist for The Poetry Foundation’s Emily Dickinson First Poetry Book Award and Nimrod’s Pablo Neruda Prize, she lives in New York’s Hudson Valley with her husband, daughter and cats. Sayra Pinto is a poet, scholar and activist dedicated to creative change. She is the author of Vatolandia and her work was included in the indigenous anthology, I Was Indian. She has a B.A. from Middlebury College, an M.F.A. from Goddard College, and is currently pursuing her Ph.D. at Union Institute & University. She lives outside Washington, DC with her partner, triplet girls and two spoiled dogs.